Vegetarianism – It’s not for the wimps! I didn’t fight my way to the top of the food chain to be a vegetarian was a bumper sticker I used to have on my car as a student. You’d think that living in the UK as a student would make it easier for me to stick to a cheaper and wholesome diet but no. I used to absolutely love eating meat every single day! Walking into a fast food place was a thrill – eating southern fried chicken by the bucket was Friday night’s menu and walking through the place known as the Golden Arches for a burger fix or hot apple pie was almost a daily occurrence. Wikipedia, the online encyclopaedia, states that vegetarianism is the practice of following a diet that excludes meat, including game and slaughter by-products; fish and other sea animals; and poultry. There are several variants of the diet, some of which also exclude eggs and/ or some products produced from animal labour such as dairy products and honey. My worst vegetable used to be karela (bitter gourd) and I hated the taste with passion. Luckily Mum never forced me or my siblings to eat this food whenever it was cooked but there mere smell of it cooking in the house would ensure a hunger strike for the day. If we knew beforehand that it would be cooking at home the same evening, we’d stock up on junk food from the school tuck shop to make sure we didn’t die of hunger. Then suddenly I grew up somewhere along the way and had kids of my own and I realised the importance of vegetables in our general diet. My daughter is actually a very finicky eater but my son eats anything and everything you put in front of him. He loves to experiment with food while my daughter picks out onions, coriander leaves, tomatoes and anything else and piles it on the side of her plate. In the dramatics department she takes after me, I must say. If she is forced to eat something she doesn’t like she will make retching sounds and heave as though I’ve just poured a litre of arsenic down her throat with some rat poison for good measure. Surprisingly she likes cauliflower, which I didn’t like while I was growing up so I do try and vary recipes so that she ingests at least one green! Being a vegetarian or having a diet that leans more towards vegetarianism is great for health and it doesn’t take rocket science to figure it out. 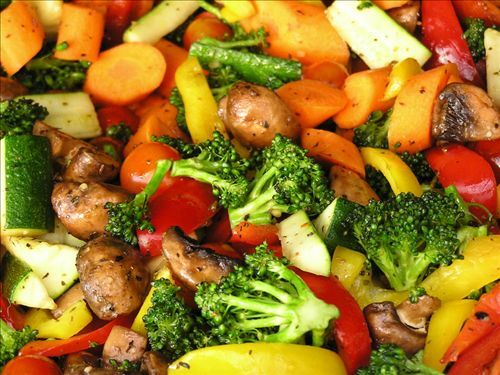 The fresher the vegetables, the more beneficial they are to your well being. The equation is the simplest one I know off head. I would suggest trying to experiment with herbs and spices to flavour the foods. A sprinkling of sesame seeds on tofu with a drizzle of soya sauce and a quick pan fry method, served up with sautéed vegetables is actually very delicious. Oregano is an herb I really love using. Who says it’s just for pizza? I even use it in basic Indian recipes that I make at home for that slight oomph in the taste, and that’s not the only herb you can experiment with for flavour. Just let your creative juices flow and you know there is so much you can do and enjoy your veggies. So including a lot more vegetables in your diet isn’t really a scary thing. You might end up liking it more and more instead of eating far too much meat which ideally your body doesn’t require. The key is to enjoy the taste and various flavours and if you’re stuck with not knowing what to do, just let Susan walk you through it. She’s a dab hand in the kitchen if you know what I mean! !